Moodle is the abbreviation for Modular Object-Oriented Dynamic Learning Environment. 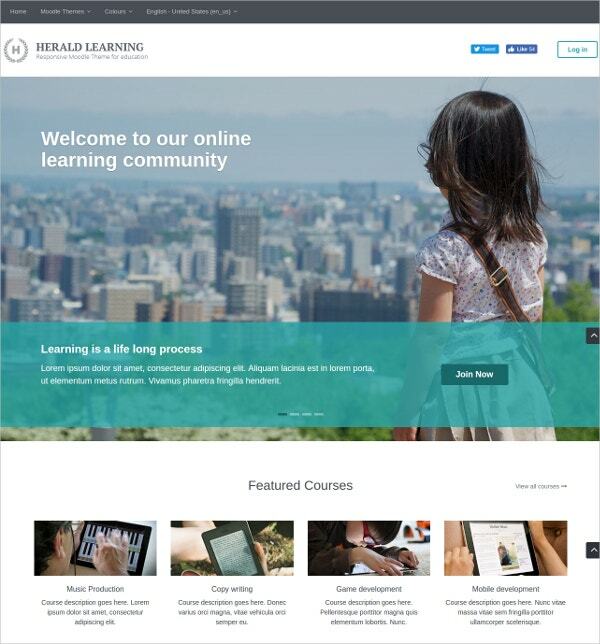 It is a platform on which one can build customized learning web portals that connect the learners with the educators. 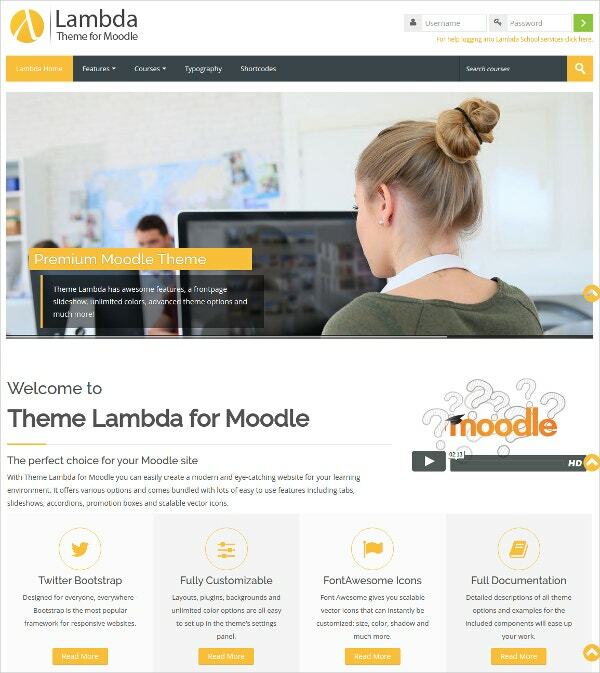 Moodle themes available today are usually responsive, which means that your site adapts to all screen resolutions and looks great, no matter whether you are viewing it on a mobile, tablet, or laptop. 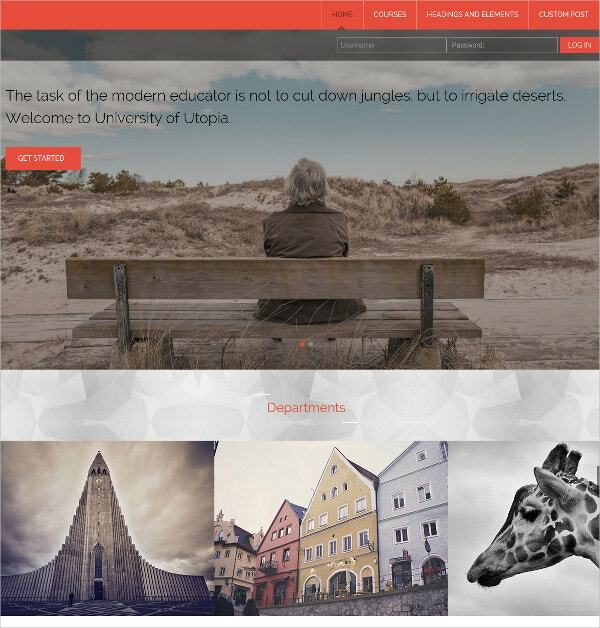 Here is a collection of some of the best responsive moodle themes available. Provided with 6 months support from the eva_pi team, this theme has lots of components and plugins, unlimited colors, high responsiveness, frontpage slideshow and carousel, font awesome icons, full layout and boxed layout, etc. 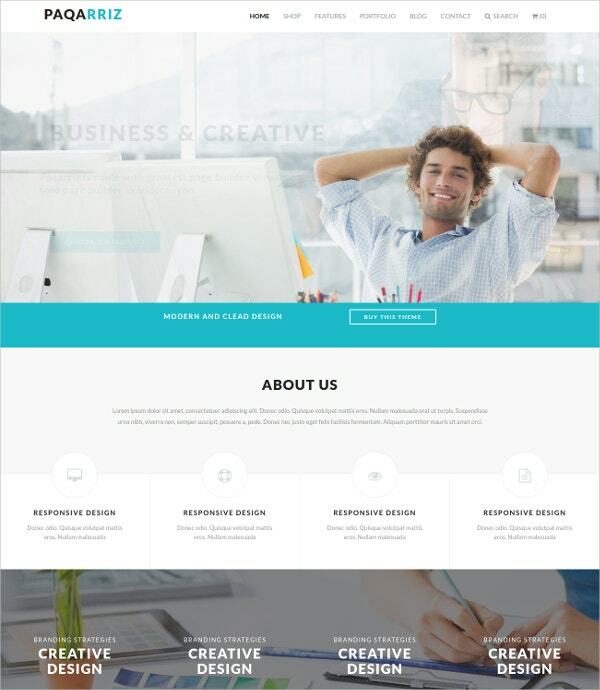 This template can be used for building a stylish and attractive learning website. This theme comes with 6 months support and is offered future updates from the author. It has highly customized UI, RTL language compatibility, APP like appearance and feel, exclusive design, exclusive login page, comfortable and easy-to-use site admin, 4 social media icons, cross-browser compatibility, featured content area, etc. This is a responsive moodle theme for governments, universities and business; and it comes with 100% money back guarantee. It is provided with 4 color schemes, 8 frontpage featured blocks, 3 footer content blocks, 6 frontpage benefits section, 4 frontpage slideshow, header/footer widget areas, 8 frontpage partners/press section, and frontpage social media section. This theme is provided with 6 months support and future updates from the author. It has an exclusive design, unlimited colors, contact with map, highly customized UI, parallax section, 3-page layout options, unique home page, RTL language compatibility, category slider, featured content, footer content, featured courses, success stories, news and updates, etc. This theme is provided with features including amazing design, own color scheme choice, unlimited fonts, 4 different pages, exclusive setting panel, free support and updates, integrated Google maps, responsive layout, 3 header combination, cross-browser compatibility, unique login page, 2 awesome sliders, full documentation, flexible moodle blocks, font awesome, TinyMCE HTML editor, etc. 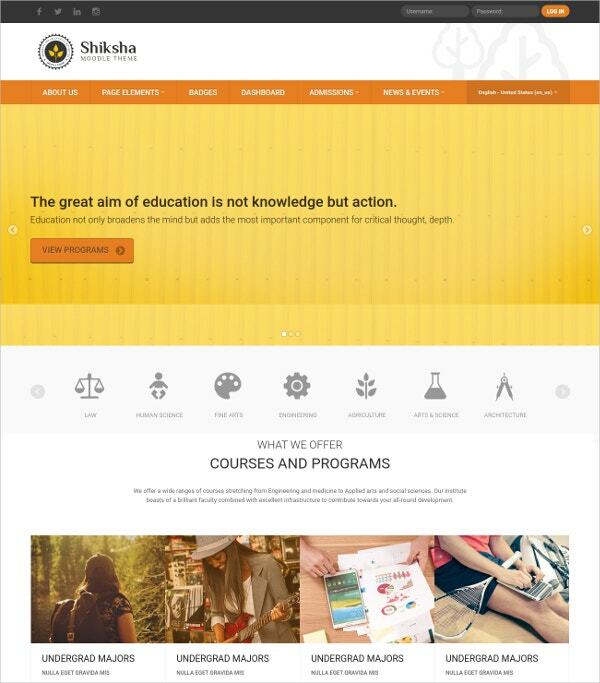 This awesome moodle theme suits any universities, educational, online courses, college, or events website. The most prominent feature of this theme is its responsive MEGAMENU. Other features are its revolution slider, SEO friendliness, included documentation, and cross-browser compatibility. Its quality is checked by the Envato team, but no further support is offered. Priced at $89, this theme comes with a 100% money back guarantee. Its features include responsive layout, custom menus, cross-browser compatibility, footer social media section, custom CSS, page “back-to-top” link, Google analytics, header/footer widget areas, user menu, font awesome icons, 2 columns fluid layout, frontpage background slideshow, and much more. The Paqarriz template is provided with six months support from the nunforest theme, and it fits websites related to portfolio, business, and agencies. 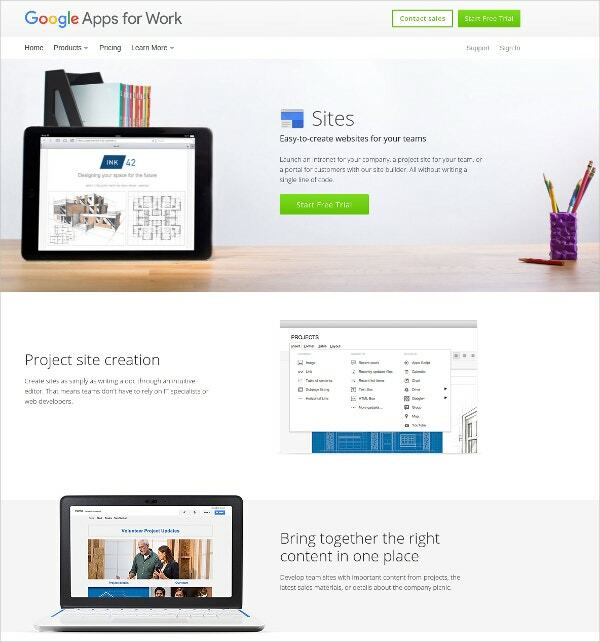 Its features are quickstart pack, drag and drop page builder, 21 different home pages, responsiveness, included documentation, two 4 column portfolio, unlimited layout configuration, different blog layout configurations and more. 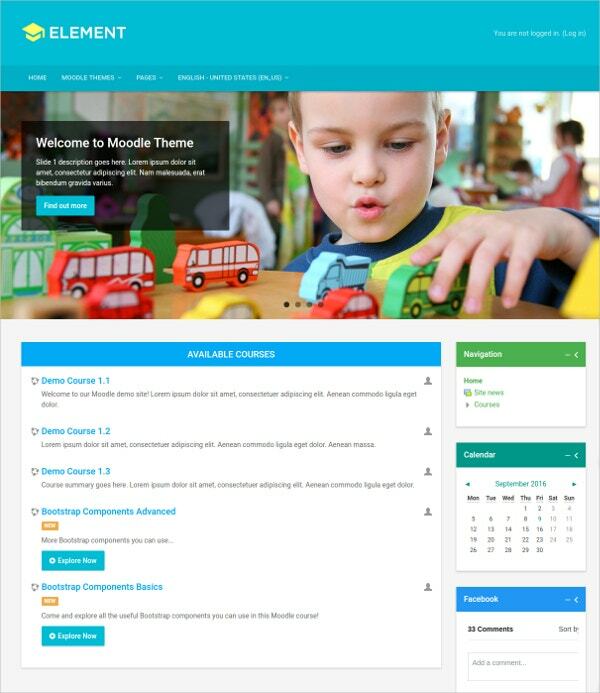 These responsive Moodle Bootstrap themes help you to create modern and attractive education based websites. As these offer a variety of options and several easy-to-use features, you can choose from these for nicely presenting your info to the world. Another reason to opt for these is the ease and comfort with which you can manage them.